Teenager Stephen Hallworth says he gained valuable experience from his UK Championship debut and loved the thrill of facing one of "snooker's big boys". 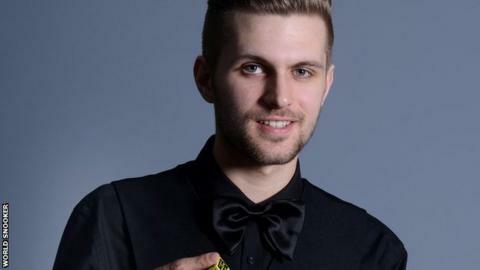 Hallworth is in the first 12 months of a two-year stint on the World Snooker Tour. But after a bright start against two-time world champion and two-time UK Championship winner Mark Williams, Hallworth was brushed aside 6-1. "It was a great experience. Mark is great player," Hallworth, 18, said. "I am loving every minute of it. Walking out in to the arena was a massive buzz. It was such a great feeling. "To be able to compete with the big boys, play them every week and travel all around the world is amazing." And Hallworth, from Skellingthorpe in Lincolnshire said he could easily have pushed his Welsh opponent much harder in Thursday's first-round match. "I felt really good at the start, settled in straight away and I felt confident," Hallworth said. "But I missed a chance to go 2-2 with a red I shouldn't have missed and found it difficult to get back into the match after that. At 2-2 anything could have happened. "You have to take your chances because it's not often you get them against the top boys." World number 111 Hallworth said his belief is growing and he thinks one good showing would really help him kick on. "I want to get into the latter stages of a competition just to set my marker as a professional," he added. "That would give me a confidence and show I can do it."